The Hanna Group was selected by the City of Folsom to provide Construction Management Services for the Orangevale Avenue Bridge Rehabilitation Project! The Orangevale Avenue Bridge, constructed in 1915, crosses Gold Creek between Placer Mine Road and American River Parkway in the City of Folsom. In 1927 the bridge became a part of the Lincoln Highway, which at the time provided the best and fastest route between New York and San Francisco. From 1915 to 1948 the bridge provided the main connection between Folsom and Orangevale. During this time the bridge connected the citrus groves, orchards and produce gardens of Orangevale, Fair Oaks and Carmichael with the processing and shipping businesses in Folsom. The open spandrel arch bridge is approximately 160 feet long and 20 feet wide with a 6” deck. 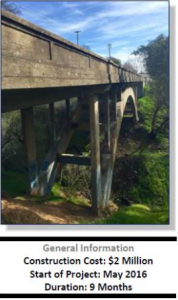 Based on the age of the structure and a condition assessment prepared in 2007, it has been determined that removal and reconstruction of the eastern abutment and wingwalls along with the deck, beams, and spandrel columns are needed. The goal is to extend the bridge’s useful life and bring the load carrying capacity of the structure up to current standards, while protecting the historic appearance. This project is a significant win for THG because we are establishing a relationship with a new client.